Also on the charity roster this year is the Alzheimer’s Society in the Northwest, which works with sufferers and the families of people living with the disease to improve their quality of life, and the Trafford Park based charity Once Upon A Smile, which provides financial support, respite breaks and friendship to young people devastated by bereavement in the family. Community development manager Sarah Pimlott explained: “Our customers continue to be so generous when it comes to donating their coins to our fountains, it’s quite incredible. We make it crystal clear that all coins go to good causes, and shoppers have responded to this superbly. “We’ve evolved a clever system of Hoovering up the coins, polishing them up in a cement mixer, and then counting the lot alongside our charity partners. Guide Dogs have given intu Trafford Centre the privilege of naming and funding the training a new guide dog puppy to assist a local blind or partially-sighted person. 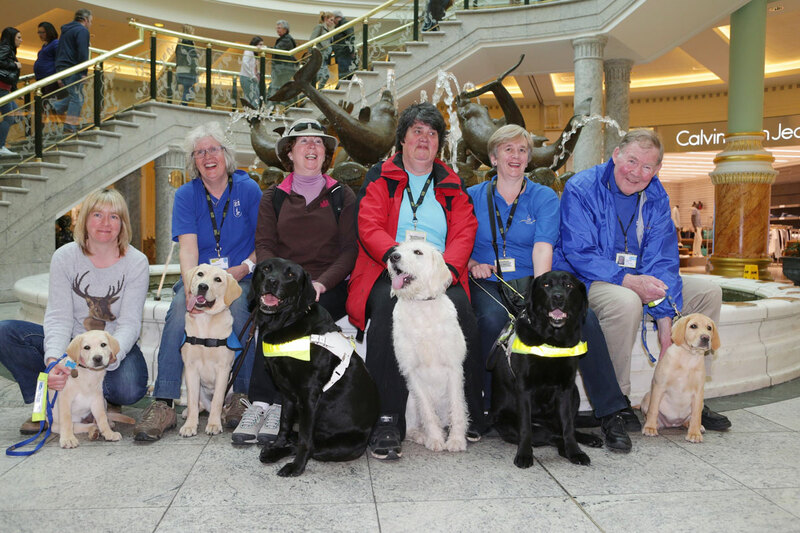 Diane Moore, Community Fundraiser from Guide Dogs, said: “We’re absolutely thrilled to have been chosen as one of intu Trafford Centre’s charities of the year. It’s a sad fact that thousands of people who are blind or partially sighted never leave home alone, and it’s only through the kind support of the general public that we’re able to continue our life changing work giving independence, confidence and freedom to blind and partially sighted people. This is why we’re so very grateful for the kind support from customers of intu Trafford Centre’”. Daniel Jillings, co-founder of Once Upon a Smile, said: “To become one of intu Trafford Centre’s Fountain Fund beneficiaries is a massive compliment to the help and support we offer as a charity. Our charity offers a unique support to families who are struggling with a bereavement, and with the help of The Fountain Fund, this will help us reach out to many more families. Added Sarah Pimlott: “Our Fountain Fund is a high-profile project that has donated more than £360,000 to charity since we opened. Which charity earns the honour of collecting, cleaning and banking the cash changes each year, and is awarded according to a set of strict criteria as set out in a public poll by intu Trafford Centre shoppers themselves. Group shot: Carolyne Jones and guide dog puppy Mario, Jacquie Wilson with guide dog puppy Jazz, Mary Leigh with guide dog Caryn, Barbara Searing with guide dog puppy Jumble, Christine Clare with guide dog Libby and Chris Howes with guide dog puppy Rosie. 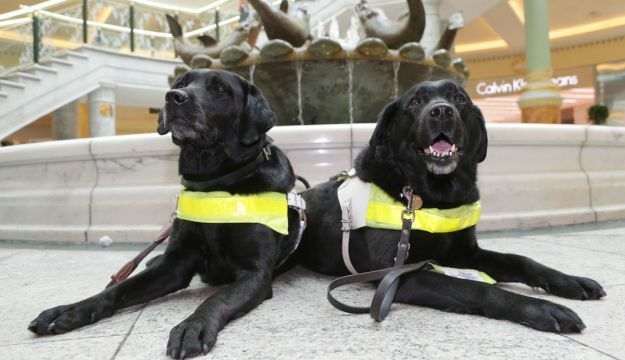 Photograph of two black guide dogs: guide dogs Caryn and Libby.